Over the last few years, strong market returns and positive mortality experience (from a pension scheme’s perspective, if not its members’) mean that a number of pension schemes are now firmly in the end game, and are considering solutions such as CDI or buyout. This piece is intended to be a brief run-through of the possible options. At the highest level, schemes have two broad options. They can run the assets off themselves (self-sufficiency), or pay someone else to take them (consolidator, buy-in, buy-out). Self-sufficiency means a scheme can keep control of its assets, and take advantage of its options. As an example, a scheme might bar-bell its investments when credit spreads are tight, then time entry into CDI or credit strategies. A scheme could also enter the credit markets without the burden of insurance company regulation, which should allow it to get more value for money. Self-sufficiency is the cheapest option, and for a lot of schemes will make the most sense. The biggest risk is often sponsor insolvency- over the lifetime of a scheme, even strong sponsors have a material probability of going insolvent. Before the SWoSS Levy was introduced, this was much more of a problem, but SWoSS allows well-funded schemes to run on after sponsor failure. 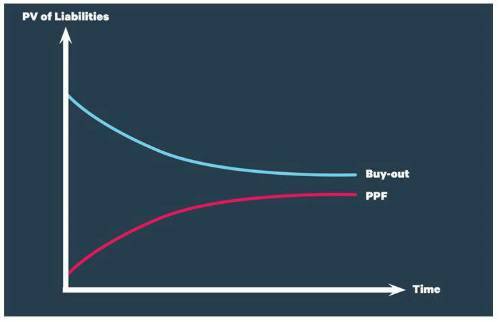 It is worth being aware, however, that while the buyout basis should ease as deferred members retire, the PPF basis should tighten. One disadvantage is the problem of hedging longevity risk, especially for smaller schemes where idiosyncratic risk is larger. As an aside though, it is worth remembering that buy-ins may well be valuable assets, even within a self-sufficiency framework. Full buyout is often seen as the gold standard of certainty (although insurers can fail too), and with good reason. There is an obvious appeal for schemes with weak sponsors, and small schemes (who have significant idiosyncratic longevity risk, less investment opportunity, and often pay higher management fees). However, while pricing fluctuates significantly, full buyout is generally the most expensive option. This raises a philosophical question. If we take insurance regulation at face value, buyout should give a scheme a 99.5% probability of success. But because of the price, the scheme may need to take more risk to get there. Holding a less risky investment strategy for longer may or may not be a better option for any given scheme. There is no a priori reason why 99.5% should be the “right” target for every scheme, and it is likely not to be for many. Moreover, with a sufficiently strong sponsor buyout would not obviously improve the security for members, and some schemes are likely to be too big to do a full buyout. It is worth noting that targeting something other than buyout does not prevent a scheme from taking advantage of a pricing opportunity to enter a buyout. However, it is likely to affect the scheme’s investment strategy. Consolidators are a new option, broadly sitting somewhere in between self-sufficiency and buyout. From a sponsor’s perspective, all consolidators will look very similar (other than price), but different structures will offer members different levels of security. Consolidators are fundamentally businesses aiming to make a profit, so the way in which they take profits, and the safeguards around that process, will impact member security. Fundamentally, the idea is to replace the sponsor covenant with a pot of capital. Whether this offers a covenant improvement will clearly depend on the existing sponsor. Theoretically, consolidators should be able to offer high levels of security at prices below those for buyouts. However, they are fundamentally untested, and the theoretical advantages, while very real, have yet to be converted into a proven benefit. There is a fundamental conflict within all such structures between investor gains and member security. Providers can and will pre-agree and “hard-code” rules to deal with this, but rules that improve one side of the equation are likely to hamper the other. Consolidators could therefore struggle on either side of this balance. This is a very brief description of the options. Ultimately there is no one “best” answer, and the choice will depend on the details of any specific scheme.